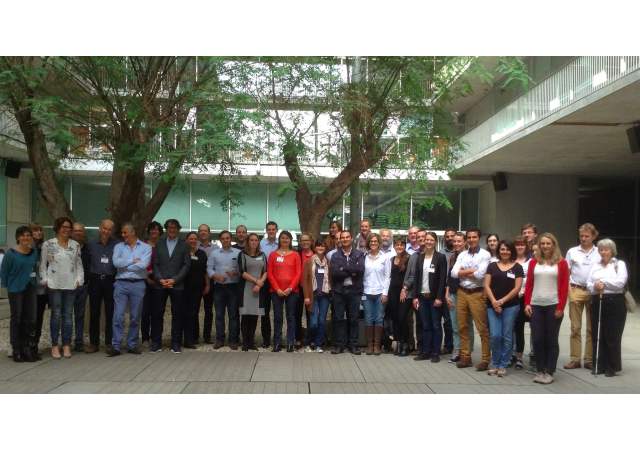 EYE-RISK has gathered the senior officials of the European project’s partners at its Fourth Annual Meeting, held in Barcelona. The sessions were also followed by the European Union’s Project Officer, Dr. Dora Navarro-Torné, together with Hendrik Scholl (Professor for Ophthalmology, Head of Eye Clinic, Universitätsspital, Basle, Switzerland), Brian Mansfield (Deputy Chief Research Officer, Foundation Fighting Blindness, FFB, Baltimore, United States) and Christina Fasser (President of Retina International, Zurich, Switzerland), who are members of the Scientific Advisory Board. The Meeting’s aims were to review the development of the first 18 months of EYE-RISK, to plan the publishing of forthcoming materials and to programme the tasks to be undertaken between months 19 and 30 of the project. To introduce the Meeting, Hendrik Scholl and Brian Mansfield delivered a presentation on the state of research into AMD, while Christina Fasser provided the viewpoint of the association of retina patients. During the sessions, the different leaders of the Work Packages explained how they are progressing and held a number of work meetings to share their achievements and the challenges they face in the coming months. The members of the Scientific Advisory Board conveyed their congratulations to the teams and made proposals aimed at improvements, given the difficulties and risks of a project of this size. At the conclusion of the Meeting, Dr. Jordi Monés presented the findings of the study Drusen ooze: a novel hypotesis in geographic atrophy, which forms part of EYE-RISK and has been presented for publication in the journal, Ophthalmology.